This team is involved in providing exceptional service to our internal and external customers. They are the key link between the creative team and external client. *Ensure the project timelines are communicated to the creative teams and completed on time and within the given budget. 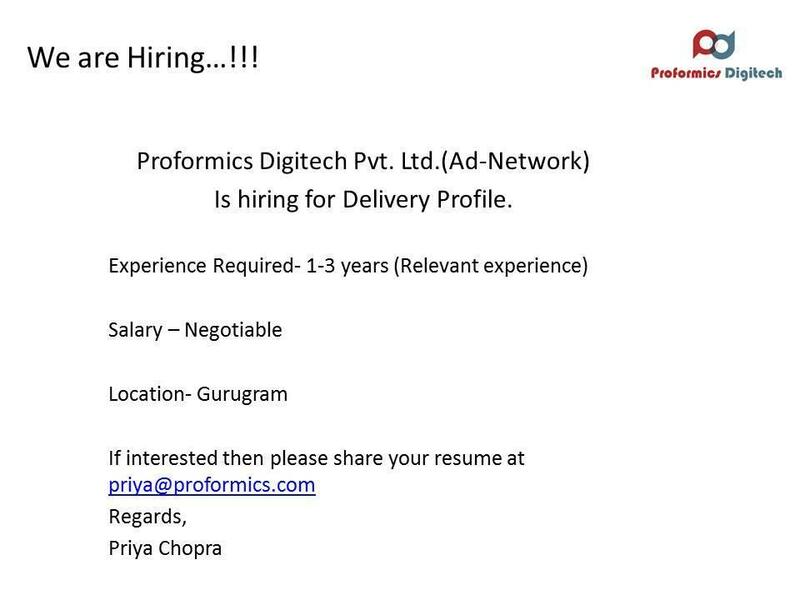 Proformics Digitech Pvt. Ltd. is looking for Delivery profile. Who can handle publishers, Recruit publishers, Validation, payment of publishers etc. On a look for Digital Marketing Executives, Copywriters, UI Designers, Creative Directors to work for award winning digital marketing and mainline agencies in Mumbai. Grab the best opportunity now. Send us your resume and portfolio at hello@whizzhr.com Let's whizz! 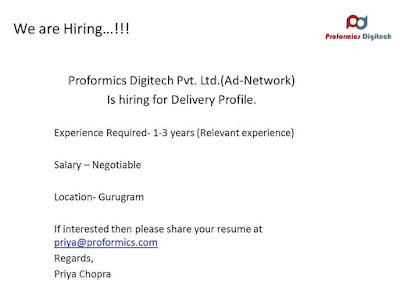 Hi All, Dentsu Aegis Network is hiring for its digital wing "iProspect" ! Interested candidates can share their updated profiles on: harleen.kaur@dentsuaegis.com. So, if you are bored with the daily corporate grind and would like to be part of a young team and see your ideas get implemented. This is your chance! This is a start-up, entrepreneurial role, with tremendous learning. Add to that a young, high learning startup atmosphere, based out of the beautiful environs of Mysore, where commute time <=10 minutes; and your savings jump up to ~ 20%. Skills Required : SEO, PPC, SMM, E-Mail marketing. If you feel this is the job you are looking for, then revert with your updated CV on careers@learnwithflip.com for further details. A senior IIM alumni Initiative, Finitiatives Learning India Pvt. Ltd (FLIP: www.learnwithflip.com) offers India's largest range of e-learning and certifications in Banking & Financial Services (BFS). We’ve pioneered the eLearning model in this space and have created India’s only private, industry endorsed certification brand in BFS. We’ve ~ 50,000 young professional alumni – both B2B & B2C. Job | Manager Marketing/Digital/Brand - FMCG - MNC - Mumbai. Urgent opening with an leading MNC company in FMCG Industry. NIBM Road Kondwa, Pune: 411048. 3 to 5 hours (Part time) 8 to 10 hours (Fulltime) Earn between 12,000 PKR to 48,000 PKR/ month. Message me or email your resume at hr@artysec.com with position interested. Candidates must have reliable Internet, work pc and electricity backup since it's a home-based position. 1. Great presence of mind, logically and analytically strong. 2. Awareness of online marketing platform (Google, Facebook, Emailer, Twitter). 3. Knowledge of MS Office, especially Excel. 5. Can manage and track daily sales and revenue. 7. Wants to learn about Digital Marketing. Only PPC Jobs. Simple theme. Theme images by 5ugarless. Powered by Blogger.